First, where do you find good data? Businesses that collect data about their operations or customers can link those data to Visio if they are stored in a structured data file like Excel, Access, SQL Server, or any other database application format. To illustrate the method, we’ll use data extracted from public records and placed into an Excel file. There is a wealth of free demographic data available for download from the US Census Bureau. The Download Center enables you to find data and then download it. Let’s show how this works with an example. Suppose we want to graphically illustrate the median household income by county for the state of Maryland. This will take a few minutes to gather the data and then you can download the zip file. Save it to a folder, extract the files, and then start Excel. I’ll give you the menu steps for Excel 2003… for Excel 2007 you can find the equivalent selections in the new “ribbon” interface but for this operation it will work similarly in both versions with a few exceptions. This gives you all of the counties in the US sorted by state. Finally, to match the county names in our drawing we must remove ” County, Maryland” from all of the entries. Select Edit>Replace and fill in the box as shown and then click “Replace All” (note that there is a blank space in front of County and that the “Replace with” field is left completely empty). This should leave only the text for the county name. In the dialog, set the Data Column to “Geography” to equal the Shape Field “County Name” as below and click “Finish”. 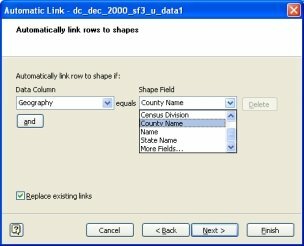 The data records are now linked to the counties and the linking process has added new Shape Data to the county shapes. The Shape Data window displays the new information when you select the county. If the Shape Data window is not open, Select View > Shape Data in the Visio menu. To color the map based on the data we’ll need a Visio 2007 Data Graphic. The MapShapes US Visio template already contains a Data Graphic that colors the regions and states according to their US Census Bureau ID number. We’re going to copy this and modify it to color the Maryland counties. 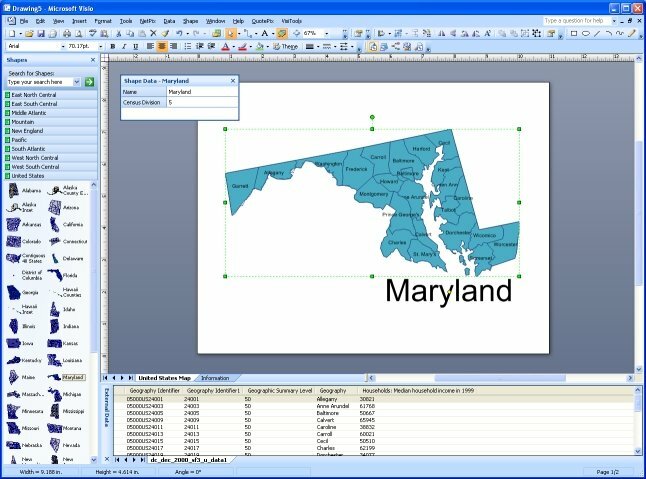 Select the Maryland shape and then Shape>Grouping>Ungroup. Although this will sever the state relationship, it provides access to the counties for data linking. Select all of the counties and click the new Data Graphic we just created to apply it to the selected shapes. 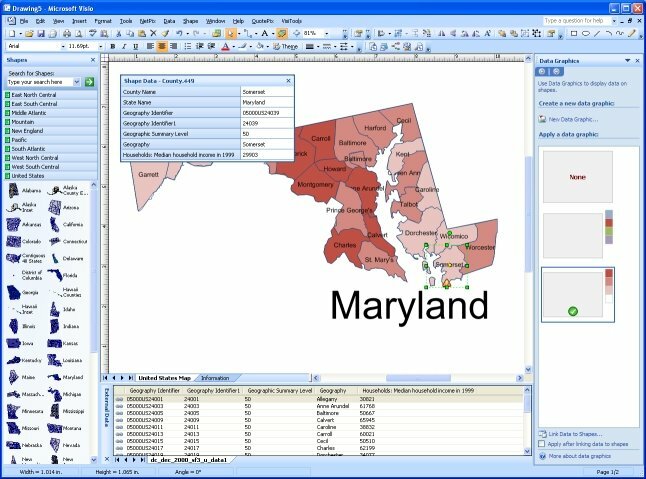 This is just one example of the data visualization versatility of Visimation MapShapes when used with freely available data and Visio 2007’s Data Linking and Data Graphics features.